Do you need a drill that gets players a lot of touches and gets them moving and working together? This 1 and 2 touch passing drill is a great drill to gets the whole team involved. Great warm-up activity. 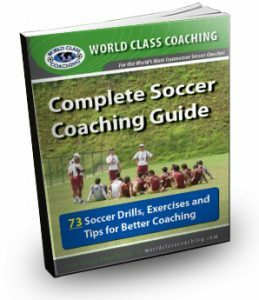 This drill, courtesy of World Class Coaching, is set up in three 10 x 10 yard grids with five players per grid that are passing and moving as a group. This is a great warm up activity that could be used to start a practice session or before a game. Players could be placed in groups by positions so defensive players and offensive players are working together. Each player can only use one touch when passing to a teammate inside the grid. All players must be moving and can’t be standing or walking while the ball is moving. This drill helps players not only with their touch, but with thinking and reading the game. Once a player makes a pass, they need to move away into another area so others can receive a pass in open space. Each player should be watching the ball and preparing to receive the next pass. A good way to challenge players is to make the receiving player be in front of the player passing. This forces players to think and move so they help their teammates by being in front and not behind where they have to turn. This drill still involves one touch passing, but players must now touch one of the corner cones of the grid after making a pass. This forces players to check out of space to touch a cone, then quickly come back into the grid to be ready for another pass. Players should be instructed to touch the cone that is closest to them rather than running across the grid or to the opposite side, which takes more time and is not efficient movement. Each player is now required to do a one touch combination when making a pass, so once a pass is made to a player, the ball must be passed back while moving so there is a combination between two players. This drill is important because players are working together similar to a game. The give and go type play is used a lot on the field and is very effective if done properly. Again, all players must be ready in case the pass comes to them for a combination play. These drills are from World Class Coaching. 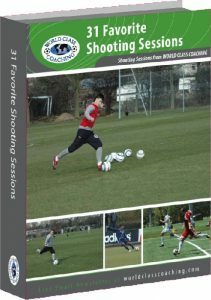 They have a large number of resources for coaches. Click the link to their site for more info. They are also offering you a couple of free e-books. Click the images below the video for more information. The YouTube video below is shot at an actual training session. The video does not include in verbal instruction. Click the arrow to play the video. Please note that some schools block access to YouTube.